Roth Händle studios: (Drumming and) Manipulating time like the chunky kid in Harry Potter. (Drumming and) Manipulating time like the chunky kid in Harry Potter. I have played drums for 30 years now and its still terribly fun to do but somewhere along the way (probably around 1998) I realized that I probably wasnt going to be "the drummer" or end up on the cover of Modern drummer. I was never really that great and I always preferred playing with bands and music I liked. Around that time I also bought my first keyboard and my awareness and focus started to moved beyond my battered old Sonor phonic plus kit. When we recorded Make Believe with Pineforest Crunch at EMI studios in Skärmarbrink, Stockholm. I was talking to the engineer, the legendary Pontus Olsson and told him. "My dream is to be a studiomusician and play drums on recordings"
He promptly solo´d a very odd and slightly off fill and commented. "So...you want to be a studiodrummer, eh? Well...that fill wont help"
At the end of this year I have been drumming on a bunch of different albums and I must say that it is really fun. I like combining drumkits, cymbals and different drumheads. Creating combinations. My focus has obviously changed a lot. I think a lot about how the drums will fit in the final production more than how to showcase my chops (which are few and far between) in the most flamboyant way possible. 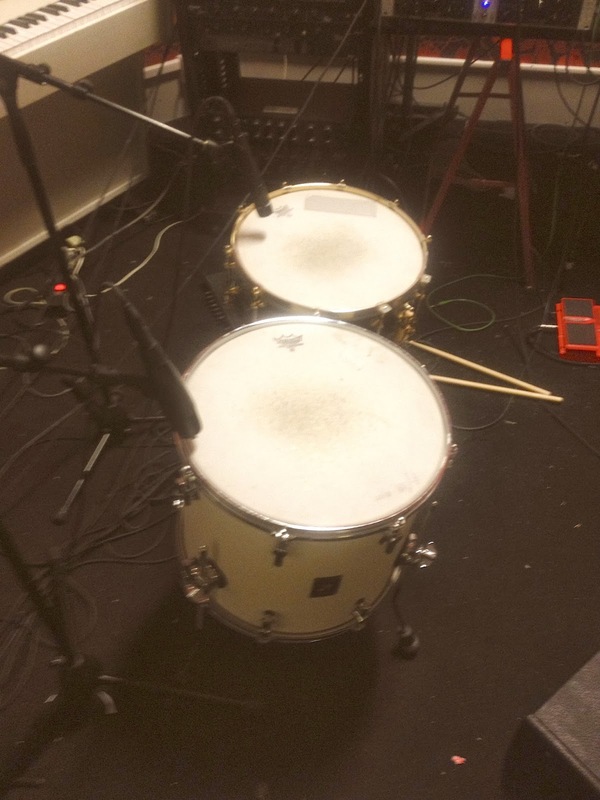 Another thing I really enjoy is overdubbing percussion. There is so much to do when it comes to percussion on recordings. It is very similar to keyboards in a way. Just by adding one hit you can change the atmosphere and feel of a song. By adding 16th notes you can create an illusion of the track being faster and quarternotes will probably make it feel "heavy". Manipulating time. Like Magic. Like the chunky kid in Harry Potter. Or Gandalf. Or Doctor Who. Or Richard Dawkins. Like the smart guy in the wheelchair with the weird boxy voice. Manipulating time. Here is a little film of me adding some Rototoms to a Carl Hasselrot track. The idea is that Im playing a bunch of different phrases so that he can move them around as he likes. Just to give the track a bit of a push....when needed. Rototoms are also really interesting is that they sound so much better when you back off from them and get a bit of room but sound horrible and flat while you are playing them. Also I was a big Miami Vice fan as a kid. There is a right and a wrong way and a right way.